The Mijireh payment gateway connects to 70+ payment processors to allow you to accept payments for your event registrations. An existing account with Mijireh is required to accept payments. Need to Buy a Support License for Event Espresso 4 (includes Mijireh)? No installation is required. 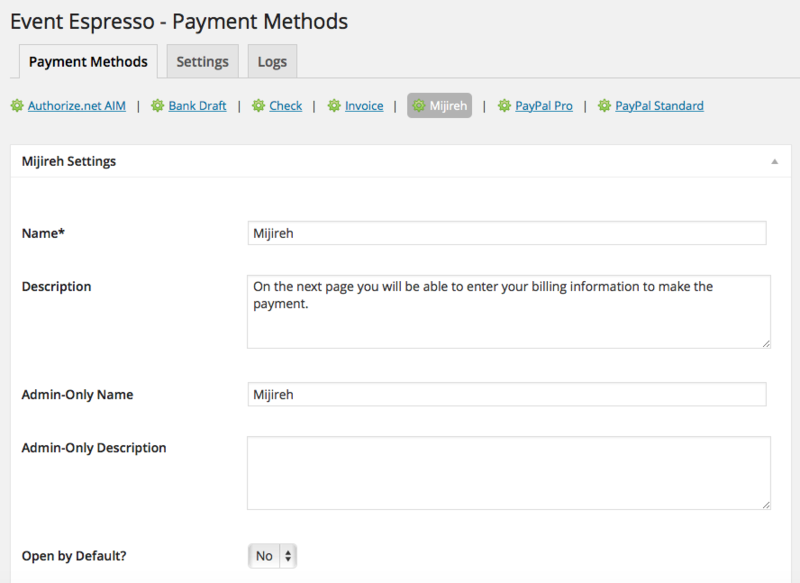 The Mijireh payment gateway is included with the Event Espresso 4 core plugin. Your credential for Mijireh is available in your Mijireh account. Login to Mijireh.com and you’ll see your Access Key in your account dashboard. Note: new accounts with Mijireh start in test mode. Once you are ready to move to live (production) mode, you can follow the prelaunch checklist in your Mijireh account which includes updating your confirming your email, updating your billing information, and selecting a payment gateway. If needed, be sure to update your Access Key in the payment methods page for Event Espresso. Will Mijireh be the only payment method enabled or the only one you offer? Click here to learn how to make it selected by default during the registration checkout. An existing account with Mijireh is required to accept payments. Mijireh will handle securing the payment area of registration checkout. A dedicated SSL certificate is recommended to make other areas of your website more secure. Login to your WP-admin (WP Dashboard) and go to Event Espresso –> General Settings –> Payment Methods. Once on the Payment Methods screen, click on Mijireh and click on the button to activate the payment method. Mijireh Access Key – This credential is needed to process payments and is available from your Mijireh.com account. Mijireh Checkout Page Design – Click this link to go to the slurp page for Mijireh. The Mijireh slurp page lets you capture the design and layout of your existing checkout page and use it on a secure Mijireh payment page. This will secure the checkout process while maintaining the design of your own site. 5) After make the edits and updating the page, click on the button that says Slurp this Page! Allow a few minutes for the process to complete and then you may unpublish or remove this WP page. It is only needed for the initial slurp process. This is an offsite payment gateway which means that attendees/registrants are transferred over to a secure Mijireh.com page with your site design to process their payment. They are then shown their registration confirmation. I configured Mijireh and payments are not being processed. Can you help? Double-check that there is no extra spacing before or after your Mijireh Access Key in the payment methods page of Event Espresso. How can I setup a recurring payment or subscription through Mijireh? Recurring or subscription payments are not currently supported in the Mijireh payment gateway. When I refund a payment, does it also refund through Mijireh.com? Refunds in Event Espresso 4 are currently a two step process. First, apply the refund through the transactional details screen of Event Espresso in your WP-admin (WP dashboard). Then login to your Mijireh account and process the refund. Is an SSL certificate needed for Mijireh?